The winner of the 2013 Prize is 'The Detour' by Gerbrand Bakker, translated by David Colmer'. Themes of infidelity, exile and isolation won over the judges of this year’s Prize to give the author his second major prize win. His previous novel The Twin won the IMPAC Dublin Literary Award. Translator David Colmer will share the prize money with Bakker, in this unique award that recognises writer and translator equally. 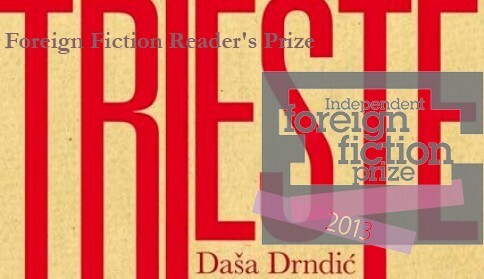 Daša Drndić’s Trieste has won the Independent Foreign Fiction Readers’ Prize, ahead of the main prize ceremony. The prize marks the conclusion of a brilliantly conceived project to engage readers and reading groups with translated fiction, organised by English PEN, the Reading Agency and the British Centre for Literary Translation. Reading groups across the UK, many of which were almost entirely unfamiliar with translated fiction, were invited to shadow the IFFP shortlist, and more than 300 people took part. More than 100 of these readers were then able to gather at the Free Word Centre in London on Saturday, for a day of events and talks. Many of the authors and translators of the shortlisted titles were in attendance, as were IFFP judges Elif Shafak and Frank Wynne, who talked about the world of translated literature, the judging process and interviewed the writers and translators about their work. Feedback from the attendees was very positive, with many reading group members saying they had not read very many books in translation, and that this scheme had “opened a whole new world”. Their eventual vote proclaimed Trieste the winner of the inaugural readers’ prize. Both Daša and her translator Ellen Elias-Bursać were in attendance to claim their champagne, which was promptly cracked open, Grand Prix style.